← How can PIP be sanctionable? Oh here we go… as if the police needed any excuse; but apparently they’re asking the home secretary for permission to use water cannons because of austerity. Chief constables are shortly to press the home secretary, Theresa May, to authorise the use of water cannon by any police force across England and Wales to deal with anticipated street protests. The Association of Chief Police Officers says that the need to control continued protests “from ongoing and potential future austerity measures” justifies the introduction of water cannon across Britain for the first time. The London mayor, Boris Johnson, has already announced a consultation on the introduction of water cannon on to the streets of London ready for use by this summer. A new Acpo/College of Policing briefing paper makes clear that chief constables across England and Wales have also been asked to discuss water cannon with their police and crime commissioners and “it is anticipated that the home secretary will be approached in early 2014 in respect of water cannon authorisation”. The Acpo briefing paper is written by David Shaw, the West Mercia chief constable, who has been leading a national Acpo/Home Office project that was set up after the 2011 riots and has been re-examining whether to introduce water cannon for the first time in England, Wales and Scotland. He cites three occasions in the past 10 years when police commanders would have considered using water cannon on the streets of London had they been available. He names them as the Countryside Alliance demonstration in Parliament Square in 2010, the Gaza demonstrations against the Israeli embassy in 2008-09 and “potentially” the student protests of 2010, when specific locations were targeted. They would also have been considered during the August riots of 2011 but he concedes they would have had only limited impact on the “fast, agile disorder” seen then. The report says there is no intelligence to suggest there is an increased likelihood of serious riots within England and Wales, but states “it would be fair to assume that the ongoing and potential future austerity measures are likely to lead to continued protest”. It adds that although the debate on water cannon was sparked by the riots in London in 2011, there was also serious disorder in many major cities and towns “of an intensity and scale where water cannon potentially could have offered an operational advantage to public order commanders”. It also discloses that the water within the water cannon tank will have to kept at 5C to “prevent the onset of medical conditions associated with the shock of being exposed to cold water”. The report adds that it would then take 10 to 20 minutes to refill from a hydrant depending on the pressure of the hydrant. A new water cannon costs between £600,000 and £1m depending on its specification and lasts for 25 to 30 years. The Police Service of Northern Ireland has six water cannon but has told Acpo it is unable to lend them for use in England and Wales. As delivery of a new bespoke water cannon can take 18-24 months, Acpo has been working since early last year on buying secondhand water cannon from Germany to ensure they are available from this summer. 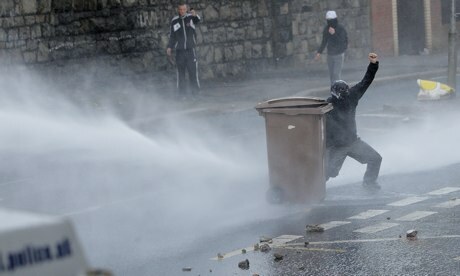 Acpo says it anticipates that any water cannon bought by a force will be regarded as a national asset. Discussions are under way over where in England and Wales they should be based but as they can be driven at speeds similar to an HGV lorry they can be sent to tackle any prolonged spontaneous disorder or to support planned police activity. They say that the alternative tactics to the use of water cannon to disperse a crowd or protect vulnerable premises are the use of baton rounds, batons, mounted officers, vehicle tactics, police dogs or even firearms. Their use will have to be authorised by at least an assistant chief constable. The national guidance will say that they can be used when conventional methods of policing have been tried and failed, or are unlikely to succeed if tried. They can also be used in situations of serious public disorder where there is potential for loss of life, serious injury or widespread destruction. However, the report acknowledges that the very presence of water cannon could be inflammatory in a volatile situation. The police also accept they would have had only limited use in halting the “fast, agile disorder” and “dynamic looting” that took place during the August 2011 riots. The Acpo report is open about the fact that the full-pressure jet from a water cannon is capable of causing serious injury or even death and says there are also possible injuries from the impact on the body of street furniture or other debris. But it says they would be deployed using similar tactics to those in Northern Ireland, where there have been no recorded injuries. The police claim there is also less potential for injury compared with using police dogs, baton strikes or protective shield tactics to do the same job. A Home Office independent expert scientific committee has already assessed the risk of injuries and made recommendations regarding their use. Joanne McCartney, Labour’s police and crime spokesperson on the London assembly, said Johnson’s proposal to buy water cannon for the Met police would be discussed next Wednesday. “The mayor’s plans to quickly roll out water cannon on to our streets is deeply worrying. This is being rushed through and Londoners are being given virtually no chance to express their views. Such a monumental shift in policing needs a proper public debate,” she said. This entry was posted in Uncategorized and tagged Acpo, austerity, Home Office, Police, protest, Theresa May, water cannons. Bookmark the permalink. In that case, wouldn’t they be justified in arresting the government for behaviour likely to cause a breach of the peace ? I think they want people to riot because they will be able to say to the “sheeple” see this is what happens when there’s no control or deterrent and they will use it as an excuse to then bring in ever more draconian measures.